A major cause for biodiversity may be biodiversity itself, says evolutionary ecologist Andrew Forbes of the University of California, Davis, whose newly published research shows that when the apple maggot shifted hosts from the hawthorn to the apple, that triggered a cascading effect on the ecosystem. Forbes and his colleagues found that a parasitic wasp (Diachasma alloeum) that attacks the apple maggot (Rhagoletis pomonella) has "formed new incipient species as a result of specializing on diversifying fly hosts, including the recently derived apple-infesting race of R. pomonella." The apple maggot, native to North America, shifted from its ancestral hawthorn host (Crataegus spp. ), to introduced European apples less than 250 years ago. "The two populations," Forbes said, "have since become partially reproductively isolated due to a number of host-related adaptations and are now distinct host races, on their way to becoming separate species." A host race is a group of organisms in the process of becoming a new species due to its close association with a particular host (plant or animal). In this new study, Forbes and his co-authors showed that the wasp D. alloeum is undergoing the same evolutionary changes. "The research shows the process of speciation in action and might tell us more about why certain groups of organisms are more diverse than others." 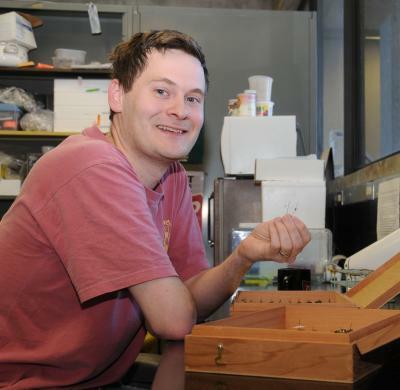 said Forbes, now a postdoctoral researcher in professor Jay Rosenheim's laboratory in the UC Davis Department of Entomology. "It also suggests why certain areas and/or biotic regions may have more species than others." The research, "Sequential Sympatric Speciation Across Trophic Levels," published Feb. 6 in the journal Science, provides insight into what Forbes calls "the tangled bank of life." "As new species form, they create new opportunities for others to exploit which, in turn, begets ever more new species," he said. "And all this is happening right before our eyes in our own backyards." The scientists, led by Forbes, studied genetic differences, diapause length and fruit odor preferences for apple-associated populations of D. alloeum wasps collected from numerous Midwestern sites. They collected the same measurements for D. alloeum in hawthorn, blueberry and snowberry. Their work showed that D. alloeum associated with apple has genetic, phenological and ehavioral differences that isolate it from the other wasp populations. 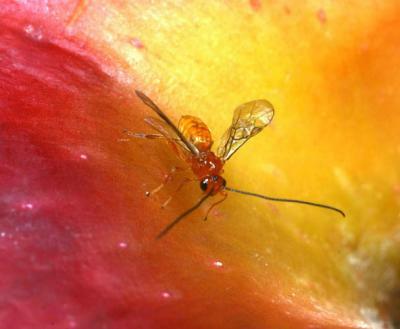 "D. alloeum attacks only R. pomonella complex flies found on these four host plants," Forbes said, "so we can be fairly confident that the apple wasp is derived from one of the other wasp populations and has rapidly evolved into this new race." In its larval form, the apple maggot is a major pest of apples throughout the United States. Other Rhagoletis species attack cherries, walnuts and blueberries. 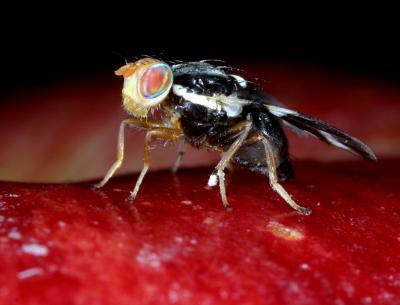 The female apple maggot fly deposits her eggs in ripe fruit. The eggs then develop into larvae (maggots), which later leave the fruit to pupate and overwinter in the soil. The parasitic wasp D. alloeum lays its eggs directly into the larva of the apple maggot as it feeds inside the fruit. The developing wasp eats the maggot and emerges the following year from its pupa.